Nginx is one of the most popular web servers in the world, known for its frequent use as a load balancer and reverse proxy. It’s more resource-friendly than Apache, and many of the largest and most highly trafficked sites on the internet depend on Nginx to serve their content. In this guide, we will demonstrate how to install Nginx on a FreeBSD 11.2 server. Before beginning this guide, you will need access to a server running FreeBSD. This guide was written specifically with a server running FreeBSD 11.2 in mind, although it should also work on older, supported versions of the operating system. If you’re new to working with FreeBSD, you may find it helpful to customize this server by following these instructions. A registered domain name that you own and control. If you do not already have a registered domain name, you may register one with one of the many domain name registrars out there (e.g. Namecheap, GoDaddy, etc.). A DNS A Record that points your domain to the public IP address of your server. You can follow this hostname tutorial for details on how to add them. If this is your first time running pkg, it will prompt you to confirm that you allow it to bootstrap itself. To do this, press y and then ENTER. Then, when prompted, confirm that you approve the installation of the nginx package by pressing y and then ENTER once again. Nginx is now installed on your server, but it is not yet running. In the next step, we'll enable Nginx to start running every time the server boots up and start it for this session, as well as walk through the process of securing the server by setting up a firewall with IPFW. In order for FreeBSD to start Nginx as a conventional service, you have to tell FreeBSD that you want to enable it. This will allow you to manage it like any other service, rather than as a standalone application, and will also configure FreeBSD to start it up automatically at boot. The parameter that you need to set for the nginx service is highlighted here in this output. The name of the script itself — the last component of the path before the colon — is also helpful to know, as that's the name that FreeBSD uses to refer to the service. While still in the rc.conf file, we will add a few more directives to enable and configure an IPFW firewall. IPFW is a stateful firewall written for FreeBSD. It provides a powerful syntax that allows you to customize security rules for most use cases. firewall_enable="YES" — Setting this directive to "YES" enables the firewall to start up whenever the server boots. firewall_type="workstation" — FreeBSD provides several default types of firewalls, each of which have slightly different configurations. By declaring the workstation type, the firewall will only protect this server using stateful rules. firewall_myservices="22/tcp 80/tcp" — The firewall_myservices directive is where you can list the TCP ports you want to allow through the firewall. In this example, we’re specifying ports 22 and 80 to allow SSH and HTTP access to the server, respectively. firewall_allowservices="any" — This allows a machine from any IP address to communicate over the ports specified in the firewall_myservices directive. After adding these lines, save the file and close the editor by pressing CTRL + C, typing exit, and then pressing ENTER. This shows that Nginx is installed and running correctly and that it's being allowed through the firewall as expected. There are still a few configuration changes that need to be made, though, in order for it to work with non-default settings or serve content using a domain name. When using the Nginx web server, server blocks (similar to virtual hosts in Apache) can be used to encapsulate configuration details and host more than one domain from a single server. We will set up a domain called example.com, but you should replace this with your own domain name. To learn more about setting up a domain name with DigitalOcean, see our Introduction to DigitalOcean DNS. Nginx on FreeBSD 11.2 has one server block enabled by default that is configured to serve documents out of a directory at /usr/local/www/nginx. While this works well for a single site, it can become unwieldy if you are hosting multiple sites. Instead of modifying /usr/local/www/nginx, let's create a directory structure within /usr/local/www for our example.com site. access_log: This directive defines the location of the server's access logs. error_log: This defines the file where Nginx will write its error logs. listen: The listen directive declares what port Nginx should listen in on. In this case, we set it to port 80 so it can listen for HTTP traffic. server_name: Here, point Nginx to your domain name and any aliases you have for it. If you don't have a domain name, point Nginx to your server's public IP address. root: This defines the website document root, which you created earlier in this step. index: This directive defines the files that will be used as an index, and in which order they should be checked. If the above command returns with errors, re-open the Nginx configuration file to the location where the error was found and try to fix the problem. As a final step, we will go over some commands that will allow you to manage the Nginx service. Now that you have your web server up and running, let's review some basic management commands. Lastly, recall how in Step 2 we enabled the nginx service by adding the nginx_enable="YES" directive to the rc.conf file. If you'd like to disable the nginx service to keep it from starting up when the server boots, you would need to reopen that file and remove that line. You now have a fully functional Nginx web server installed on your machine. From here, you could encrypt your server’s web traffic by enabling HTTPS. To learn how to do this, consult How To Secure Nginx with Let's Encrypt on FreeBSD. You could also install and configure MySQL and PHP which, along with Nginx, would give you a complete FEMP stack. Buildbot functions through at least one Buildbot master which runs and checks all build configuration and other settings, and distributes the actual builds to its workers. Additionally, the master offers a browser-based user interface subcomponent which, if enabled, is used to trigger or view builds and check status reports and other settings. There are also one or more Buildbot workers which connect to the master and receive commands, namely to run builds. In this guide, you will use FreeBSD jails to install and run each Buildbot component in a separate, isolated environment. You’ll then serve Buildbot using the Nginx web server and access its web interface using a web browser on your local machine. After completing this guide, you will have a working setup with a sample project build, ready to extend for your own CI or other use cases. A server running FreeBSD 11.2, although newer and older supported versions of FreeBSD should work as well. If you’re new to working with FreeBSD, you may find it helpful to customize this server by following our guide on How to Get Started with FreeBSD. Nginx installed on your server. Read how to set this up by following our guide on How to Install Nginx on FreeBSD 11.2. A DNS A Record that points your domain to the public IP address of your server. This is required because of how Let’s Encrypt validates that you own the domain it’s issuing a certificate for. For example, if you want to obtain a certificate for example.com, that domain must resolve to your server for the validation process to work. You can follow this DNS Quickstart guide for details on how to add this. Throughout this tutorial, we will use example.com as an example domain name. An SSL/TLS certificate for your domain. Follow How To Secure Nginx with Let’s Encrypt on FreeBSD to set this up. Because Buildbot allows external contributers to run code on your system, it’s recommended that you isolate its various components to prevent arbitrary or malicious code from taking up your server’s resources. In this tutorial, you will do this using FreeBSD jails. Similar to LXC, Docker, and other container mechanisms, FreeBSD jails offer lightweight isolation from the host system. Processes running inside a jail can only access the resources to which the jail was already granted access; otherwise, they behave like any other FreeBSD environment. Jails share the same kernel but typically run on a filesystem that has a copy of the FreeBSD base system, which may be any version of FreeBSD compatible with the host kernel. For most workloads, performance differences between running a task on the host versus in a jail are not noticeable. Several external software packages exist to help with the creation and management of FreeBSD jails. Since none of them are the de facto standard, we will use the operating system’s built-in jail configuration mechanism. First, we want to create a separate network interface for the system’s jails. In jails, the kernel rewrites network connections to the first IPv4/IPv6 address assigned to the jail. For example, if the first assigned IP address is public and a service in the jail listens on 127.0.0.1:1234, port 1234 will be publicly accessible. The recommended practice is to have a separate network interface for jails. We will follow this recommendation of “cloning” the primary loopback interface (lo0) into a separate interface (lo1). We’ll use the network 10.0.0.0/24, but any other non-overlapping network will work as well. The output shows that the interface exists, but has no IP addresses listed and attached to it yet. Its flag LOOPBACK means that this interface is only available locally and does not represent an actual hardware device. This code assigns a fixed hostname and IP address on the jail network interface, 10.0.0.2, and specifies the root filesystem, /usr/jails/buildbot-master. The exec.start and exec.stop values used here declare that the jail's start and stop services will behave like boot processes and use the startup and shutdown scripts found in the /etc/ directory. The persist option lets the jail keep running even if all of its processes are finished. To learn more about possible master jail settings, check out the jail(8) manpage. After adding this content, save and exit the editor. If you're using ee, do this by pressing CTRL+C, typing exit, and pressing ENTER. If you already have jails on your system configured with the /etc/jail.conf global file but you haven't used jail_list before, enabling this setting will mean that only the jails in jail_list will auto-start and you may want to add your existing jails to the list. Next, we will create the master jail's root directory and extract the FreeBSD system. This command will prompt you to approve installation of the ca_root_nss package. Do so by pressing y and then ENTER. Looking at these lines, notice how the worker jail has a different hostname, IP, and root filesystem directory from the master. Save and close this file. This confirms that the jails are running as expected. At this point, however, they have no access to the internet, which means you won't be able to install the Buildbot packages within them. Continue reading to resolve this. Although the master and worker jails are running, both of them are closed off from the internet. Opening them up to the internet is necessary, as they must be able to install packages as well as communicate with one another. Next, route the outgoing internet traffic from the jail. To do this, use IPFW – FreeBSD's built-in firewall – to set up NAT (network address translation) networking rules. When you complete this step, traffic going out of the jail network will be translated to the public IP address of your host. If you followed the Let's Encrypt tutorial from the prerequisites, you will already have the firewall configured to allow access to your web server. In that case, some of the below steps will be redundant but there's no harm in running through them again. Warning: Performing erroneous changes to your firewall configuration can render the remote host inaccessible over SSH, so it's important to ensure that you have an alternative method you can use to log into the machine. For example, if you're using a server obtained from DigitalOcean, you can access it through the "Console access" feature. sudo sysrc firewall_myservices="22/tcp 80/tcp 443/tcp"
At this point, the firewall service will start and begin protecting the host from connections to unsecured ports. Note: If something went wrong or you used a different firewall type, the firewall may not yet know the state of your SSH connection, causing your connection to the server to stall. You can find out by typing something into the shell. During a stalled connection, the characters won't be printed on the remote side. If this is the case, you can either wait until SSH notices the timeout, or drop out of the hanging terminal by pressing these keys one after another: ENTER, ~, . If the SSH connection can't be reestablished, you will need to connect to it using an alternative method. If, for example, you're using a DigitalOcean Droplet, you could use the its "Console access" feature to log as your root user with the password your set previously. With the firewall stopped, you'll be free to to debug the problem. # Add basic rules as defined by firewall_type, firewall_myservices, etc. >&2 echo "Missing network interface"
>2 echo "No such network interface: $interface"
. /etc/rc.firewall includes the system's predefined IPFW rules script, which adds basic rules according to your configuration of the firewall_* variables in /etc/rc.conf. The next block checks whether all configured interfaces exist. This is for your safety and quits the script early if there's a misconfiguration. The directives starting with ipfw add the actual firewall configuration and rules. Each rule – added in the lines starting with ipfw add – has a number. The firewall uses these numbers to evaluate the rules in sequential order. ipfw nat 123 config if $ext_if creates an in-kernel NAT facility with the ID "123" to translate traffic using the public-facing network interface. ipfw add 1 allow all from any to any via $jail_if allows all traffic between the jails. Note that if an allow rule matches, rule processing stops and the packet is allowed to pass. ipfw add 3 skipto 20000 udp from any to any 53 out via $ext_if keep-state and the following skipto rules define which outbound traffic to allow and to consider for network address translation. If there is a match, processing continues by jumping to rule 20000, which performs NAT. Between rules 6 and 19999, there is an intentional gap where the /etc/rc.firewall script inserts the basic rules. If none of the above skipto rules match, the basic rules will take care of allowing different types of traffic including loopback, incoming ICMP ping messages, and the ports specified by firewall_myservices. ipfw add 19999 deny all from any to any comes after all the basic rules and ensures the end of non-NAT rule processing, essentially disallowing all traffic that was not matched by a previous allow rule. ipfw add 20000 nat 123 ip4 from any to any out via $ext_if translates the address of all outbound IPv4 packets leaving on the external interface. You only need IPv4 here because, in this tutorial, jails are assigned IPv4 addresses exclusively. ipfw add 20001 allow ip from any to any is only required if you have turned off one-pass mode for nat rules, in which case processing will continue after going through the rule 20000, requiring you to explicitly allow those packets through with a separate rule. For the default one-pass mode, the firewall will stop processing at the nat rule and therefore ignore rule 20001. With that, you've successfully prepared both jails to run like a regular operating system, set up internet access for each jail, and started both of them. The next two steps in this tutorial will walk you through installing both the master and worker components and then running them as services. Buildbot's components are split into several packages. You only need to install the py36-buildbot package to run the master component, but in this guide we will also go over how to install the web interface package, py36-buildbot-www. Please note that, in this guide, shell command blocks are marked with a different color if they must be executed within a jail shell. Additionally, the command prompt will reflect which of the jail's user profiles – either the root or unprivileged buildbot-master user – that commands must be run under. If you haven't yet installed or used the pkg package manager in this jail, it will prompt you to confirm that you allow it to bootstrap itself. To do this, press y and then ENTER. Then, approve installation of the Buildbot packages by again entering y. From this point on, all master-related setup and changes should be executed as the unprivileged user, as this will help to keep ownership and permissions consistent. Unlike other CI software like Jenkins, Buildbot's behavior is defined directly in its configuration file, which is interpreted with Python. This allows for streamlined versioning of your configuration, while the use of a scripting language allows for the freedom to write custom build configurations and extend existing Buildbot functionalities. The configuration file contains a password required for workers to connect to the master. Replace the default pass with a secure password of your choosing. Also, our worker's name will be worker0, so also replace example-worker with worker0 in both the WORKERS and BUILDERS sections. With that, you've created the master directory structure and configuration, but the service isn't running yet. To run Buildbot manually, one could run the command buildbot start from the master directory, /var/buildbot-master. However, this does not take care of boot-time startup or other system-wide configuration. Instead, we will use rc scripts, FreeBSD's standard method for running services. Specifically, we'll do so using the service utility. You have successfully configured and started the Buildbot master service. The second component, the worker, is required to actually run builds. You will install one worker in the next section inside a second jail and then configure its connection to the master service. Although the Buildbot master is running, no builds can occur since you need at least one worker running. This step is similar to the previous one in that we will set up a separate jail first and then install the service. This time, however, the Buildbot worker component will connect to the master to listen for commands and report results back. The instructions in this step are almost identical to the master setup, except that the worker component is part of another package and the only configuration changes you'll make involve adding details about connecting it to the master and some display information about the worker itself. Remember that, in this guide, command blocks are marked with a different color if they must be executed within a jail shell and the command prompts will reflect which user profile the commands should be run under. As this command runs, it will prompt you to confirm whether you want to bootstrap the pkg package management utility. Do so by entering y. It will also ask you to confirm that you approve the installation of the packages, so enter y again when prompted. The built-in mechanism for running a worker is buildbot-worker start, which should be run from the worker directory, /var/buildbot-worker. However, this does not take care of boot-time startup and does not ensure that it will run under the correct user. As you did with the master, leverage the packaged rc script by using the service utility, to manage the service. If the service started successfully, a message like Connected to 10.0.0.2:9989; worker is ready will appear in the log file. If you forgot to specify a new password earlier in this step, the service will fail to connect to the master. In this case, edit the file /var/buildbot-worker/buildbot.tac and then run service buildbot-worker restart to rectify this issue. With that, the second jail has been configured and you have all the basic components needed for operating Buildbot. 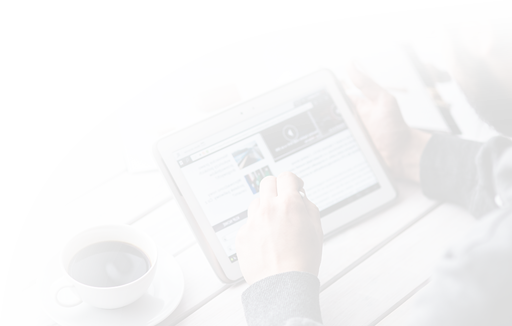 To be readily usable for your users, it's recommended that you also set up the web-based user interface. Doing so will allow you to control Buildbot and see build results with greater convenience. Buildbot features a web-based user interface that shows build overviews and results, and allows you to trigger builds manually if a "force" scheduler is configured, as is the case in the sample configuration. Your master configuration already sets up the www component to serve HTTP over port 8010. In a production setting, you would not serve unencrypted HTTP or open up the non-standard port 8010 to the outside, as this would open your system up to security vulnerabilities. Also, the web interface can be served from any URL path, which means that it does not need to be the only application on your domain. For example, you could serve build outputs or logs to your users. Hence, we will serve the UI to users with a separate web server – Nginx – in order to support HTTPS, protect internal ports, and gain the ability to serve other content alongside the Buildbot web interface. This configuration forwards all requests below the URL path /buildbot/ to the web interface and enables WebSocket support, which is used by the interface to receive updates that it will display such as the log output of a running build. Alternatively, if you did not set up a domain name for your server, you'll instead need to enter your server's public IP address, http://your_server_ip/buildbot/. 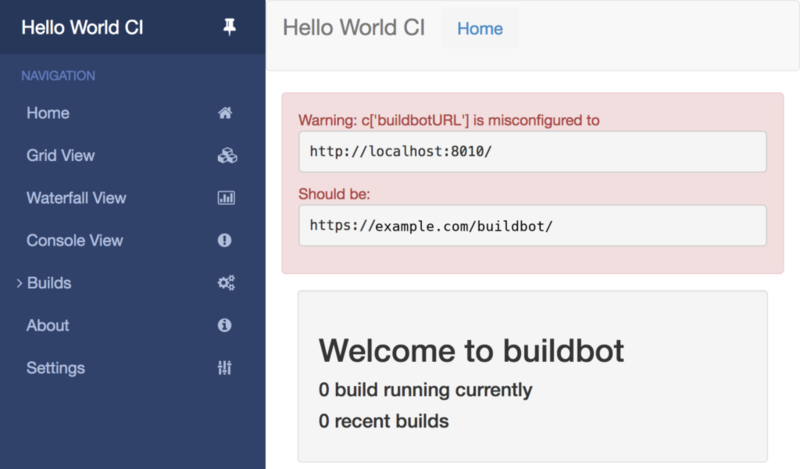 The main page may show a warning that the Buildbot URL is misconfigured. This occurs if the hostname provided in the nginx.conf file mismatches what's listed in master Buildbot configuration. Since build result emails contain links to the Buildbot web interface by default, the master must know the correct URL where it can be reached. With that said, to resolve the warning and send emails that contain the correct content, edit the Buildbot master configuration to point to your domain. Refresh the Buildbot web interface in your browser, and the warning will disappear. Continuous Integration servers often serve other purposes besides CI. For example, a CI server might serve build outputs for FreeBSD packages or logs over HTTPS. It's therefore recommended that you reserve the URL path /buildbot/ for the web interface. This allows you to host more applications under different paths. For the moment, we will create a simple home page that redirects to the web interface. You can add more links once you implement more use cases for the web server. Note: If you did not follow the prerequisite Nginx tutorial and create a new web root for your Nginx configuration, you will instead need to create an index file under the default Nginx web root by running sudo ee /usr/local/www/nginx/index.html. Save and close this file, then enter your domain name or IP address in the URL bar of your browser. It should automatically redirect you to the Buildbot interface. You've finished the installation of all the Buildbot components, including its web-based control and viewing interface. With all of this in place, let's run an actual build as specified in the sample configuration which we have set up for the master. The builder has a "force" scheduler configured by default, which allows you to trigger your first build. 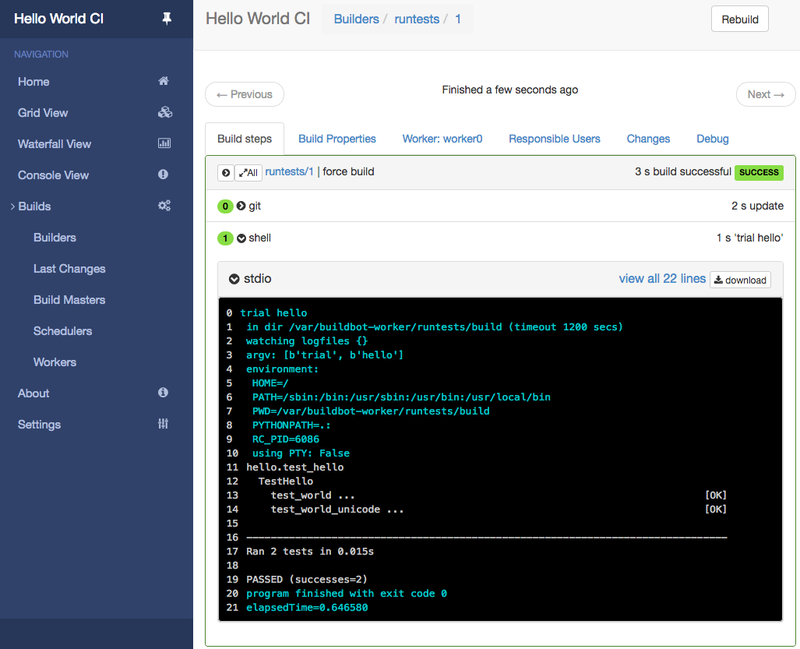 In the web interface, click Builds > Builders > runtests > force > Start Build and see how the build runs. If you see any errors, check the server's internet connection and whether all the dependent packages were installed as described previously. You have successfully configured a permanently running and versatile CI system and can now begin implementing your own builds. By completing this tutorial, you practiced creating FreeBSD jails and learned some of the basics of the Buildbot automation framework, resulting in a ready-to-use installation. To learn more about Buildbot and its configuration, we encourage you to read through the official Buildbot documentation. In the tutorial, you used a separate, host-internal network lo1 for your jails. In this guide, we used ipfw for NAT purposes, but other firewalls have this feature as well. Check out the FreeBSD documentation about available firewalls. Unless your use case requires otherwise, it is recommended to keep the jail network inaccessible from the outside through the use of NAT or other mechanisms. Buildbot's web interface does not require a login or check user permissions by default. To implement these, you will have to enable user authentication. FreeBSD is a secure, high performance operating system that is suitable for a variety of server roles. In this guide, we will cover some basic information about how to get started with a FreeBSD server. This guide is intended to provide a general setup for FreeBSD servers, but please be aware that different versions of FreeBSD may have different functionalities. Depending on which version of FreeBSD your server is running, the instructions provided here may not work as described. The first step you need to take to begin configuring your FreeBSD server is to log in. On DigitalOcean, you must provide a public SSH key when creating a FreeBSD server. This key is added to the server instance, allowing you to securely log in from your local machine using the associated private key. To learn more about how to use SSH keys with FreeBSD on DigitalOcean, follow this guide. To log in to your server, you will need to know your server’s public IP address. For DigitalOcean Droplets, you can find this information in the control panel. The main user account available on FreeBSD servers created through DigitalOcean is called freebsd. This user account is configured with sudo privileges, allowing you to complete administrative tasks. You should be automatically authenticated and logged in. You will be dropped into a command line interface. In this output, you can see that the default shell for the freebsd user is sh (also known as the Bourne shell). On Linux systems, sh is often an alias for bash, a free software replacement for the Bourne shell that includes a few extra features. In FreeBSD, however, it's actually the classic sh shell program, rather than an alias. If you ever want to return to the Bourne shell you can do so with the sh command. Although tcsh is typically the default shell for FreeBSD systems, it has a few default settings that users tend to tweak on their own, such as the default pager and editor, as well as the behaviors of certain keys. To illustrate how to change some of these defaults, we will modify the shell's configuration file. As you go through this file, you can decide what entries you may want to modify. In particular, you may want to change the setenv entries to have specific defaults that you may be more familiar with. if ($term == "xterm" || $term == "vt100"
When you are finished, save and close the file by pressing CTRL+C, typing exit, and then pressing ENTER. If you instead edited the file with vi, save and close the file by pressing ESC, typing :wq, and then pressing ENTER. It might not be immediately apparent, but the Home, Insert, Delete, and End keys will work as expected now. One thing to note at this point is that if you are using the tcsh or csh shells, you will need to execute the rehash command whenever any changes are made that may affect the executable path. Common scenarios where this may happen occur when you are installing or uninstalling applications. With that, the tcsh shell is not only set as your freebsd user's default, but it is also much more usable. If you are more familiar with the bash shell and would prefer to use that as your default shell, you can make that adjustment in a few short steps. Note: bash is not supported on FreeBSD 11.1, and the instructions in this section will not work for that particular version. You will be prompted to confirm that you want to download the package. Do so by pressing y and then ENTER. The next time you log in, the bash shell will be started automatically instead of the current default. Save and close the file when you are finished by pressing CTRL+C, typing exit, and then pressing ENTER. If you'd like to make further changes to your shell environment, like setting up special command aliases or setting environment variables, you can reopen that file and add your new changes to it. By default, FreeBSD servers do not allow ssh logins for the root account. On DigitalOcean, this policy has been supplemented to tell users to log in with the freebsd account. Because the root user account is inaccessible over SSH, it is relatively safe to set a root account password. While you will not be able to use this to log in through SSH, you can use this password to log in as root through the DigitalOcean web console. You will be asked to select and confirm a password for the root account. As mentioned above, you still won't be able to use this for SSH authentication (this is a security decision), but you will be able to use it to log in through the DigitalOcean console. If you choose not to set a password and you get locked out of your server (for instance if you accidentally set overly restrictive firewall rules), you can always set one later by booting your Droplet into single user mode. We have a guide that shows you how to do that here. By now, you should know how to log into a FreeBSD server and how to set up a bash shell environment. A good next step is to familiarize yourself with some FreeBSD basics as well as what makes it different from Linux-based distributions. Once you become familiar with FreeBSD and configure it to your needs, you will be able to take greater advantage of its flexibility, security, and performance.